Splendid Ship Models, Priceless Paintings and Maritime Antiques at Boston Harbor Auctions April 13th Sale. 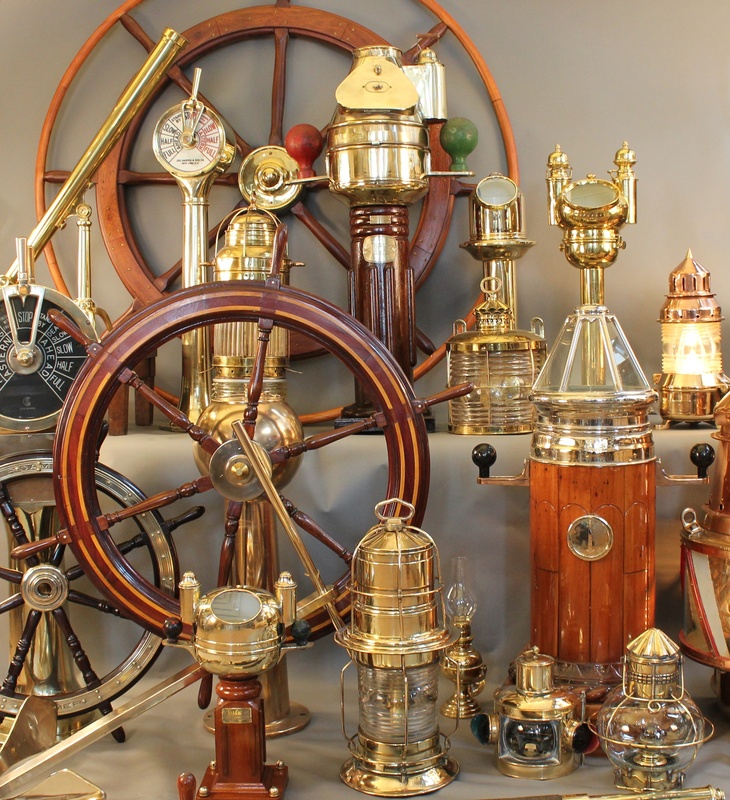 A stunning array of ship models, some with gold plated fittings, marine paintings by marine artists such as James Buttersworth, Mary Blood Mellen and William Gay Yorke, and enough gleaming brass maritime artifacts to fill a freighter will be sold at Boston Harbor Auctions April 13th Sale at the 99 High St. Tower in Boston. 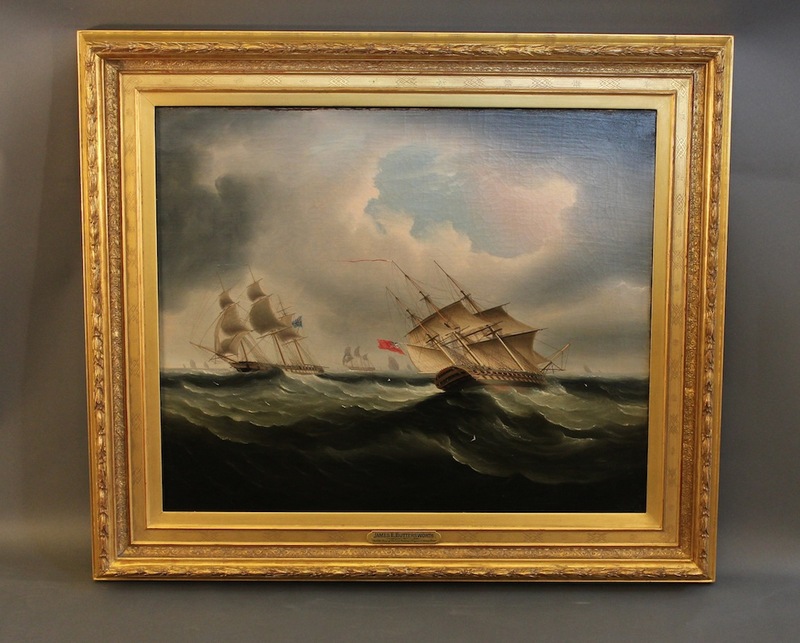 Marine paintings to be sold at the Marine Auction include a rare James E. Buttersworth painting titled “British Ship of the Line Passing a Frigate in Heavy Seas”. It is a powerful painting showing two large English Warships carving through a big ocean. It is estimated to bring 280,000 to 300,000 dollars. A William Gay Yorke painting, dated 1859 shows the “Rappahannock”, a full rigged Bath Maine built packet ship is accompanied with a painting of the ship’s handsome captain William Drummond. “Rappahannock”, launched in 1841 was the largest US built ship at that time. A collection of marine paintings by British artist William Henry Bishop will be sold including America’s Cup Yachts, Steam Yachts and Frigates. 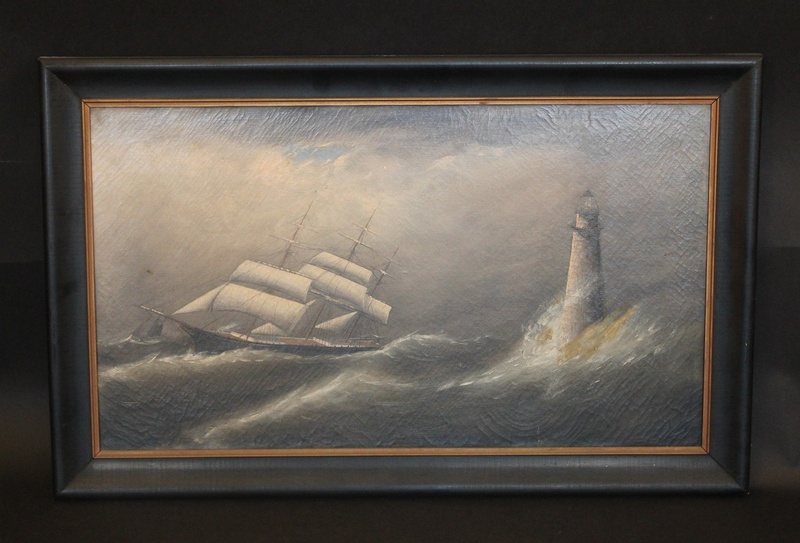 A Clement Drew oil shows a windjammer passing by Minot’s Ledge Lighthouse off the Coast of Cohasset, Mass. Also at auction a rare18th century barometer from a direct descendent of John Adams and John Quincy Adams. The barometer was made by R. Huntley, 125 Oxford St., London. Lighthouse and ocean beacons are cherished artifacts and there are six beacons here as tall as seven feet with cut crystal fresnel lenses. 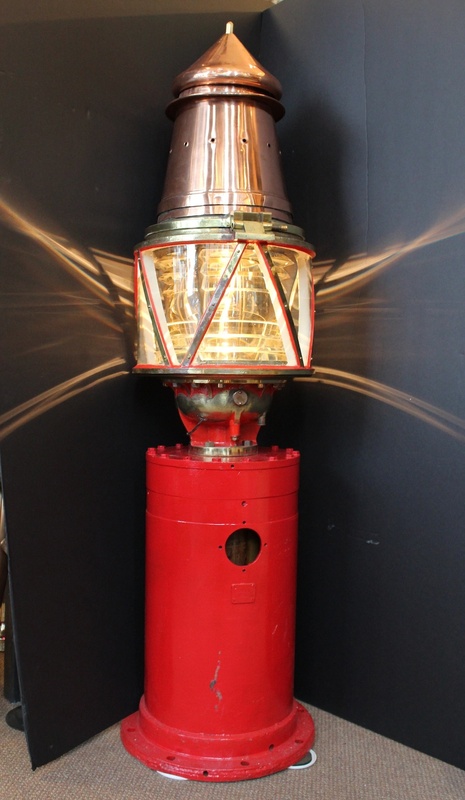 Also on offer are many antique ship’s lanterns from 19th century makers. A six foot expertly carved eagle by Peter Libbey, one of his masterpieces with gold leaf finish and mahogany sternboard will be sold. Full speed ahead! With the seven unique engine order telegraphs, used to send commands from the ship’s bridge to the engine room. 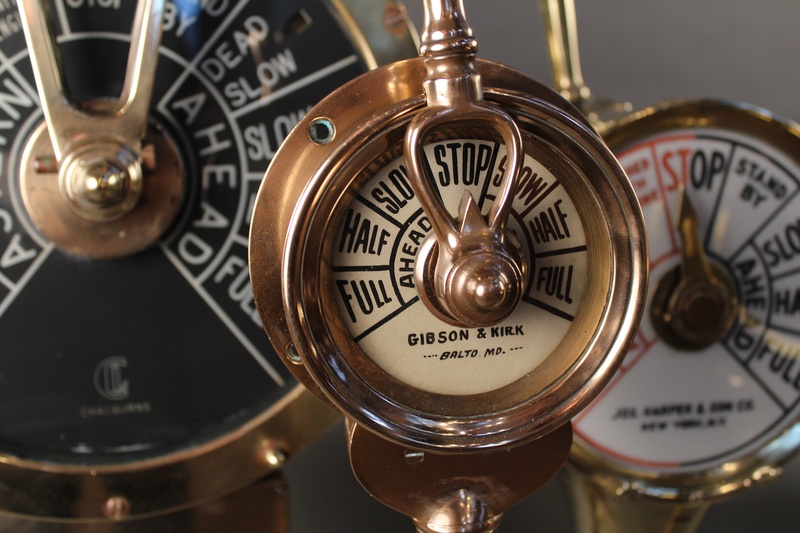 The telegraphs being sold come from yachts, a tugboat, Liberty Ship and a French Cruise Ship. Up Periscope! Carl Zeiss of Germany produced this polished aluminum instrument. It is the style used in Panzer tanks. Two solid brass 19th century library telescopes and a precision pair of giant military border binoculars will be sold. Other optics include a large 30-inch long pair of powerful binoculars with rotating turret lenses from 1915 by Ernst Leitz. The fleet is in! 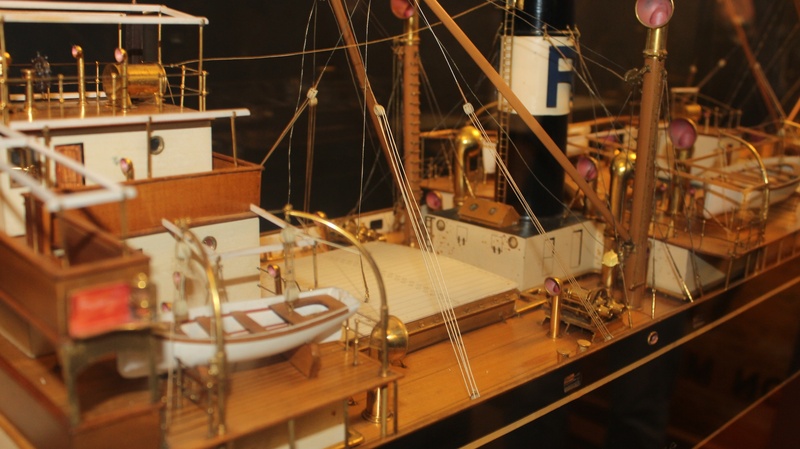 The age of sail and steam is shown with the intricate model ships to be auctioned. Gilded age steam yachts like J.P. Morgan’s Corsair, six original boardroom models of freighters, along with America’s Cup yachts, stately frigates and vintage pond yachts are part of the fleet of sixty five models on display now through auction day. GPS: 185 Purchase St., Boston, MA at the corner of Congress St.
Showroom bidding, online bidding, phone bidding and absentee bidding available. Please contact Larry Lannan at the Lannan Ship Model Gallery 617 451 2650 for any questions.